It’s common for people to use the terms compliance and audit interchangeably, but there’s actually a significant difference between compliance and audit. Compliance is about meeting legal and regulatory obligations. There are things that every organisation must do to make sure they comply with laws, rules and regulations at a Federal, State and local level. From lodging tax returns to preparing financial reports, these are legally mandated compliance activities that are done periodically. If an organisation doesn’t meet its compliance obligations, it may face significant penalties like fines or even lawsuits and reputational damage. Corporate compliance also often incorporates an organisation’s own internal codes of conduct. These may outline how people are expected to behave and what things the organisation needs to operate efficiently and effectively. Many organisations have their own compliance functions. Their role is to enable the business to meet its compliance needs. They aren’t there to tell people what they can’t do, but rather help them meet their objectives and obligations. To do this the compliance function must not only look at what the organisation currently does but also be involved in more strategic aspects of the business to make sure that it continues to meet its compliance obligations. Compliance is not something that an organisation can set and forget. It’s an ongoing process that should always be open to improvement and may need to change whenever laws and regulations require. Compliance often works at each level of the business, from senior management through to the shop floor. While significant elements of their role are strategic, compliance also needs to be hands-on when it comes to finding solutions to issues. Without a detailed knowledge of the business, compliance functions can’t help the organisation identify how best to meet its obligations. An audit involves being independent. Audits are impartial and intended to look at what the organisation has done and make sure that it’s in line with what they said they did. Effectively an audit function monitors and evaluates how effectively and efficiently the business has met its own internal control policies, processes and procedures. It ensures that the policies, processes and procedures of the business are being followed correctly and identifies opportunities for the business to manage its risks. Essentially, the audit function gives the business assurance that its intentions are being followed through. 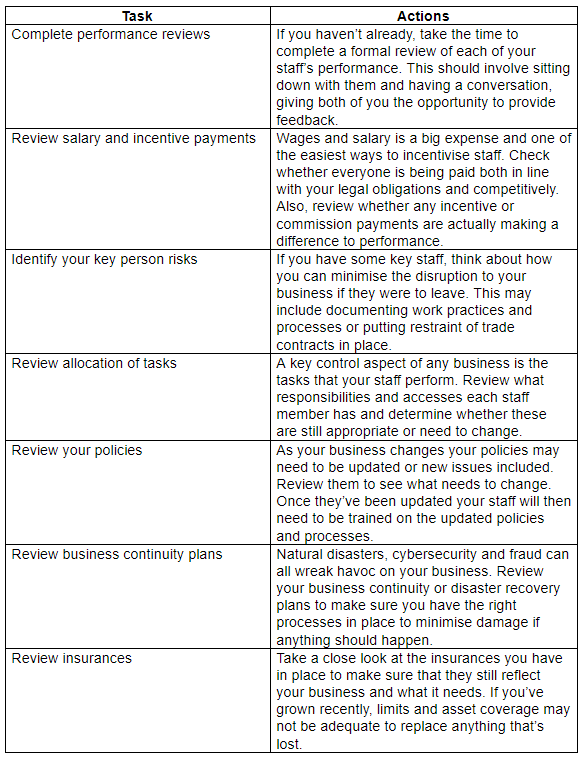 Many organisations have an internal audit function that is responsible for identifying risks within the business. These risks could be control issues or policies that have not been implemented effectively, for example. The internal audit function searches for control deficiencies and makes recommendations to address these. The internal audit function is not to be confused with the role of external auditors. Companies are generally required to have their financial accounts and annual report audited by external auditors. This is a very specific role prescribed by legislation, whereas an internal audit function generally has a much wider responsibility that is driven by the organisational objectives and requirements. A key part of audit’s role is looking back at what the organisation has done and identifying where this may need to change in the future. While there are aspects of strategy to the audit function, it’s far more focused on monitoring the here and now. Like compliance, audit is a continuing process but one that is often planned or periodic. The audit function will work with management to identify what areas of the business are in most need of review or where controls are at risk. This can cover anything from financial controls to supply chain, inventory management, IT systems or even the organisational culture. Some of these areas are relatively easy to identify, while others like organisational culture, for example, are much more challenging to monitor and assess. While audit functions by their very nature must get into the detail of a business, they’re most often accountable at the highest level. Audit reports are generally submitted to the board and senior management. While compliance and audit are like two sides of the same coin, they play very different roles. While audit may monitor what the organisation is doing and find deficiencies in a company’s policies, processes and procedures, it may not identify whether the organisation has actually complied with its legal obligations. However, compliance will look at a policy, process and procedure from the lens of regulatory compliance. Does it meet legal obligations? Are laws being followed? Can the organisation meet its regulatory obligations? That said, an audit may, and often does, incorporate aspects of compliance. While auditing an organisation, areas where compliance obligations have not been met may be identified as these represent significant risks to the business. Have tax returns been lodged? Are the financial reports completed? Has the company made all the disclosures it’s required to under law? Compliance is often involved in strategic discussions about where the business is going and what it needs to achieve its objectives in a compliant way. While audit takes those objectives and looks back to see if they were achieved in the way they were meant to be. Every organisation needs aspects of both audit and compliance. They each play an essential role in the corporate governance of a company and must work together to make sure the organisation is operating effectively. If you need advice on how to ensure you’re meeting all your company compliance obligations, get in touch with CCASA. As we wrap up for the year and some workplaces close for a well-deserved break, there’s never been a better time to look forward and set some goals for your business in 2019. With clearly defined objectives and a solid business plan in place, you’ll set yourself up for a productive and rewarding year. Ring in the New Year with confidence and purpose and hit the ground running with this list of business goals for 2019. There’s nothing more dangerous to your business than resting on your laurels. If you haven’t revisited your processes and policies in years, it could be impacting the growth and development of your business. What’s more, the regulatory environment is constantly changing, so by not reviewing your processes and policies to make sure they’re compliant with current laws, you could be putting your business at risk. Introducing a new product or service, entering a new market or growing your staff are just some of the activities that should drive a review of your operations. But even if none of these events have occurred in your business, it’s still critically important to review your business through a digital lens. In 2019, businesses that aren’t leveraging automation to streamline and improve their systems and processes are going to be left behind. Automating functions like job management, accounting and inventory will save your business time and money and empower business owners and managers to make informed, data-driven decisions. Make sure to take the time to thoroughly review your processes and policies at the end of this year to ensure that they’re compliant with current laws, aligned with your growth strategy and driving a positive workplace culture. For many businesses, managing your cash flow can be one of the most difficult parts of the job – but it’s also one of the most important. As things get busy, it can be easy to lose track of your finances. A reactive approach to incoming invoices and outgoing paychecks means you’ll always feel like you’re just keeping your head above water. Take a proactive approach to your finances in 2019 by establishing a solid forecast and debtor strategy. Start by reviewing your costs for 2018. By having a thorough understanding of where your money is going – the big expenses as well as the little ones that add up – you’ll know where you can cut back to improve your cash flow, and where you can increase spending to help you reach your business goals. Make sure you have a realistic budget and review your business plan to help you anticipate future financial obstacles, so you know how much you’ll need to spend throughout the year. A good budget will give you clarity and insight into how many sales you need to cover costs and how much money you have to reinvest in your business. 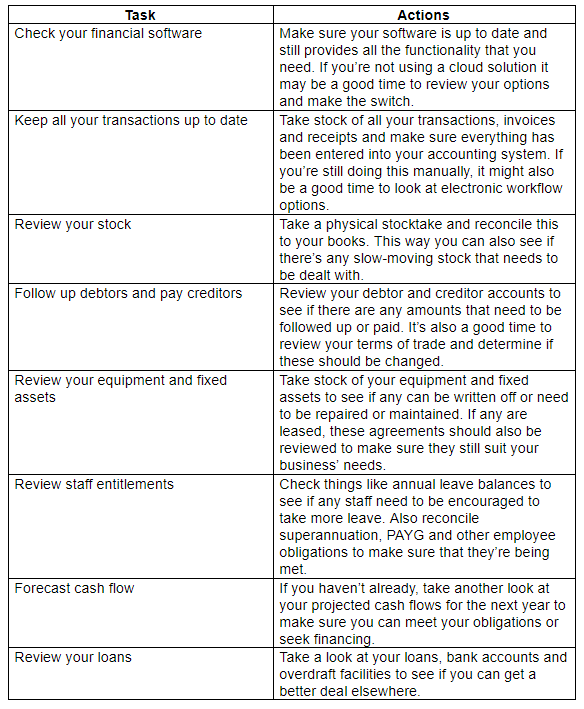 Now is also a good time to review and upgrade your accounting processes. It’s critically important to keep an accurate record of your finances, and your system should allow you to regularly run and review financial reports – a spreadsheet isn’t going to cut it. Consider hiring a good bookkeeper, accountant and business advisor to help you out. The ROI will be clear when you realise how much time you’re re-claiming to focus on activities that grow your business. You should also review your invoicing approach. Implement discount settlement rules to encourage your debtors to pay early and consider creating a template SMS and email to send to your customers when you need to follow up a late invoice. You could also consider automating the discount process with an app like Settlement Discounts. It will save you hours of time and help you improve your cash flow. Your business is only as strong as the people working in it. Your company culture is one of the most important factors for attracting top talent, retaining key employees, and ensuring that staff are productive and satisfied. On the other hand, a poor company culture can lead to dissatisfied and unhappy employees, loss of key staff, high costs associated with recruiting and retraining, and an overall negative impact on your business’s growth and development. To improve your company culture in 2019, make sure to review your employee policies, including remuneration, incentives and perks, employee recognition and appreciation activities (such as parties, shout-outs and awards), your business’s social events calendar and employee development programs. Staff will be happier if they feel valued and appreciated in the workplace. Make sure to also review your business’s core values and integrate these into your day-to-day operations. Staff tend to be happier at work if they understand and respect a company’s values and feel they’re working towards a common goal. It’s also important to maintain an open line of communication with your staff, so make sure your policies incorporate feedback loops and other forms of formal and informal communication activities. In 2019 if you’re not online, you’re missing out on huge opportunities. For most businesses, your website is your most important marketing tool. It’s often the first impression your customers have of your business and it’s where people go to research your business, purchase your products and services, and interact with your brand. Next year, make sure you have a strong online presence that includes a website (optimised for both mobile and desktop) and a strong social media presence – it’s one of the best ways to interact with your customers. A strong online presence and aligned online marketing strategy will drive new customers to your business, keep old ones engaged and help you grow your business. Take the time at the end of this year to review your online presence, where your brand ranks in search engine results (your SEO), your online marketing strategy, and how you’re using your social media accounts to see where you can improve. Small business owners wear many hats. From bookkeeping and IT to social media and customer service, taking responsibility for every role within your business can be exhausting. What’s more, by taking on too many roles, you risk not giving enough of your attention to any. There’s only so much time in the day and by multi-tasking and switching focus constantly, you’re likely to forget important details and make costly mistakes. By outsourcing some of your business functions, such as your company compliance obligations or your bookkeeping, you give yourself more time to focus on the high-value, revenue-generating aspects of your business. Not only will it save you time and allow you to focus on your business’s growth, but outsourcing to experts ensures that you meet all your obligations and that nothing that could put you and your business at risk is overlooked. By taking some time to review and set goals for your policies, finances, marketing efforts and company culture, you can make sure that your business gets off to a good start in the new year. If you need help ensuring that your goals are aligned with your company compliance obligations, get in touch with CCASA. We’d love to help you have a productive 2019. While the end of a year is always a race to finish our to-do lists, the beginning of a new year provides an opportunity to set up for success. It provides an opportunity to set aside some time to get to those tasks that are important but not necessarily urgent. These things can help you improve profitability, manage cash flow, access finance and respond to new opportunities as they arise. To help you prioritise your valuable time, here’s a checklist of things you can do to start 2019 on the right foot. Managing your finances involves more than getting the debits and credits right. It’s also important to make sure your systems and processes are running smoothly and your business is able to maintain positive cash flow and grow profitability. Managing staff is one of the most important elements of running a business, but there are many things that can be overlooked. It’s essential that your statutory obligations are all up to date to avoid penalties or any unnecessary issues with regulators or the authorities. 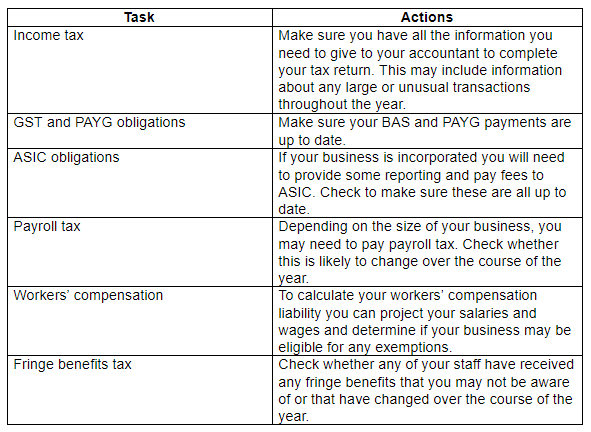 By staying on top of these obligations you can make sure that your business gets off to a good start in the new year. If you’re not sure about your company compliance obligations or need help making sure you have met them, get in touch.